Restaurant Deals | A Savings WOW! Want to have a fancy date night at a great price? Get a 4-course farm-to-table meal at Travelle Kitchen and bar for $45 per person or dinner for 2 at the Willis Tower’s 67th-floor private club for only $89. Find these deals on Travelzoo. Receive 40% in cash back rewards when you claim this deal at Groupon, link it to your eligible Visa card and use that Visa card for payment at Sumo. The cash-back rewards will be credited to your card statement after every purchase at Sumo for as long as the deal is valid. While you are on Groupon’s site, check out the other fantastic deals they have at local and national restaurants. It’s a great way to experience new ones without breaking the bank! Now through September 25th, kids eat free every night between 4 pm-10 pm at participating IHOP restaurants. Receive one free kids’ entrée with each adult entrée purchase. The free entrée is valid for kids 12 and under on “Just for Kids” menu items at participating restaurants. Download the Lou Malnati’s app, link your credit or debit card(s), use it to place your order through the app and earn 1 point for every $1 spent. Earn points for every friend that signs up with your referral link. You will receive a $20 reward for every 250 points earned, which you can use Monday-Thursday. New users will receive $5 off your first order when you use this link to sign up for the Lou Malnati’s app. Download the new Portillo’s App from the iOS App Store or Google Play. Create an account and enter the code HOTDOG when checking out and you’ll receive $5 off an order of at least $15 through August 31st. (When I used the app for the first time, I also received a free Portillo’s T-shirt when I picked up my order for being one of the first 200 to download the app. Your location may also be participating in that promotion.) Five lucky app users will even win Portillo’s Meals for a year. Also, sign up to receive a free slice of chocolate cake on your birthday at Portillo’s. 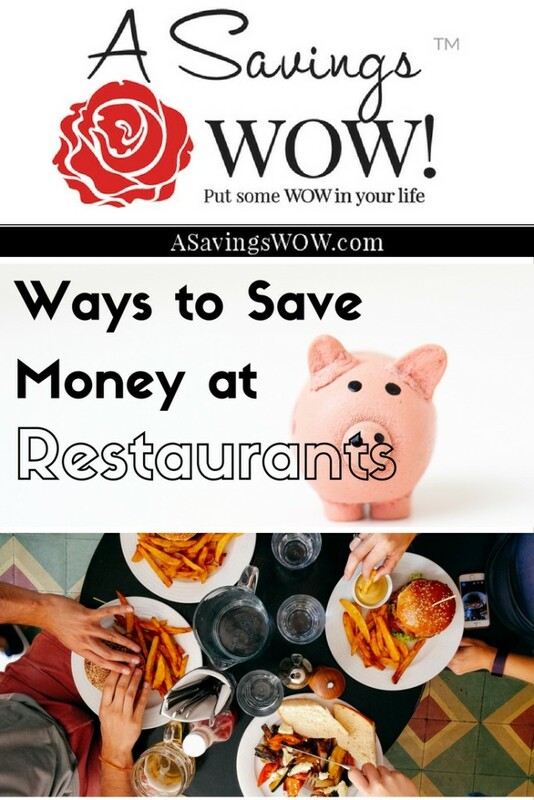 Which are your favorite way to save money when dining out?